The damp and humid climate of parts of China made it necessary to crush the lumps of snuff that would form, and this led to the development of flat or dished surfaces. The earliest form of the snuff dish was apparently integral and can be seen on glass bottles with slightly concave or flat circular facets on their main sides. 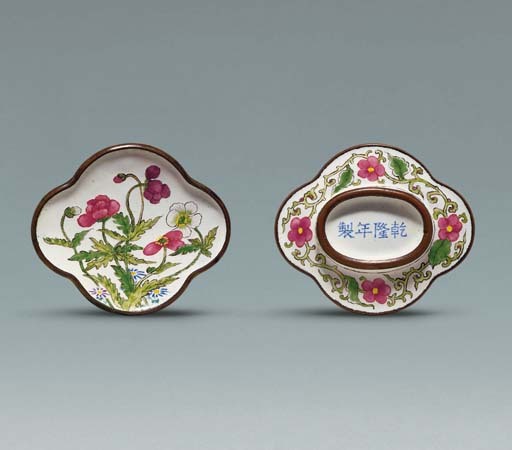 At the beginning of the Qing dynasty, it is unlikely that the Manchus would have used separate snuff dishes, but once they had successfully conquered China, they quickly adjusted to elegant, courtly life and thus separate dishes may have evolved as a functional accessory from the mid-Qing dynasty, halfway through the Qianlong period, and then became standard in the nineteenth century. Although the vast majority of snuff dishes were not made to match a particular bottle, there is no doubt that some were. See H. Moss, By Imperial Command. An Introduction to Ch'ing Painted Enamels, pl. 45, where a Guyue Xuan enamelled glass bottle and dish from the Alex Cussons Collection is illustrated. Lot 680 in this sale, also a Guyue Xuan enamelled and relief-decorated glass snuff bottle, has also, quite remarkably, retained its original dish. The enamels and style of painting suggest that this bottle and dish were products of the last decades of the Qianlong period. See two quatrefoil dishes of very similar design, from the collection of the Seattle Art Museum, and illustrated by L.S. Perry, Chinese Snuff Bottles - The Adventures and Studies of a Collector, p. 28, middle row. See also an enamel-on-copper dish illustrated by Moss, Graham, Tsang, The Art of the Chinese Snuff Bottle. The J & J Collection, no. 468.